"Throughout my twenty years of executive traveling in upscale hotels and resorts did I rarely experience such a high quality of food, customer service, and room luxury. The Bailey masters the true art of hospitality that will make your overnight stay absolutely unforgettable!" Site written by FlawlessCopy.com and designed by SeaDragon Design, a Cincinnati Web design firm. The Bailey Hotel in Humboldt, Kansas, is the perfect place to escape from the hassles of modern life. Stepping into the bed-and-breakfast style hotel is like stepping back in time. Instantly you are swept away to a simpler, more refined era, and your soul rejoices in the peace, quietude, and nostalgia of days gone by. Every space in the Bailey Hotel is gracefully embellished in gorgeous vintage furnishings. A sketch of Mark Twain and an Argentinean chandelier greet guests as they approach their rooms, while a fireplace with a handcrafted walnut mantel brightens up the lobby. Replica candlelight sconces softly illuminate the hall outside the guest rooms. Different varieties of wood from around Kansas—ash, cherry, elm, maple, oak, and walnut—serve as the central theme of each of the guest rooms. Almost every piece of furniture in each room is either an authentic antique or a handcrafted replica made from that room's particular wood. The comfortable and lavish beds are the highlights of the collections, particularly the king-size beds in the Oak King and Ash King Suites. Also enhancing the splendor of the hotel are the magnificent architectural features, such as the stained glass windows in the Cherry and Maple Suites. A spired onion dome pointing from a corner of the Bailey Hotel punctuates the Humboldt skyline, and embossed-tin ceilings even bring an indoor thrill to upward glances. Some of the amenities are truly modern pleasures, such as the heart-shaped Jacuzzi bathtubs in the Oak King and Ash King Suites. Although, most features return one to a more rustic time, such as the elegant wall sconces and black and white photographs adorning the walls of the Walter Johnson Cafe in the Bailey Hotel. Among these are photos of Humboldt native and Hall of Fame pitcher Walter Johnson himself. or email us at info@thebaileyhotel.com. Who Stays at the Bailey Hotel? Visitors to Humboldt, Iola, Chanute, and elsewhere. 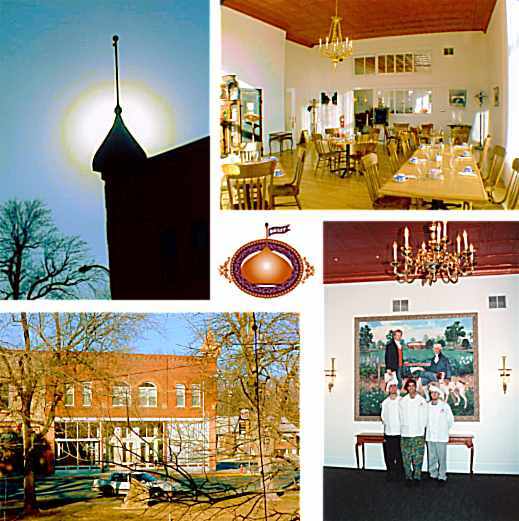 Guests of all sorts in Humboldt, Chanute, Iola, or any of the other surrounding towns in Allen and Neosho Counties will enjoy their experience at the Bailey Hotel. Indulging yourself in the utter luxury and nostalgia of the Bailey Hotel is a precious treat that everyone deserves from time to time. Imagine a cozy reminiscence of the past in a setting that could be right out of Norman Rockwell's own painted memoirs. Travelers passing by Humboldt. The Bailey Hotel is the perfect pit stop for anyone traveling to or from Tulsa, Joplin, Kansas City, Lawrence, Topeka, and other places. Humboldt passers-by can stop in at the Bailey Hotel and escape for a night or two during their journey. How does a relaxing bath in a heart-shaped Jacuzzi bathtub sound? 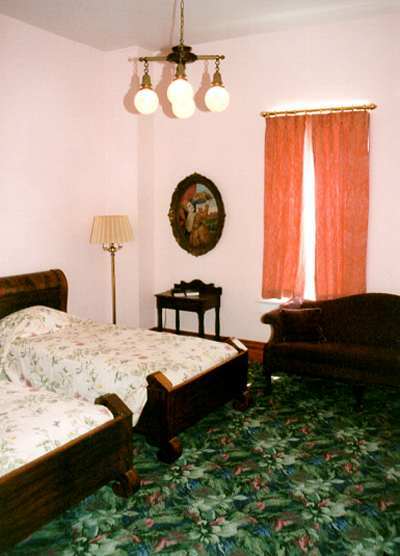 In a clean, cozy, warm, nostalgic atmosphere with the charm and service of a bed and breakfast? Indulge yourself, and recharge your body and mind for your return to the long roads ahead. Romantics. The Bailey Hotel is also the perfect setting in which to kindle romance. 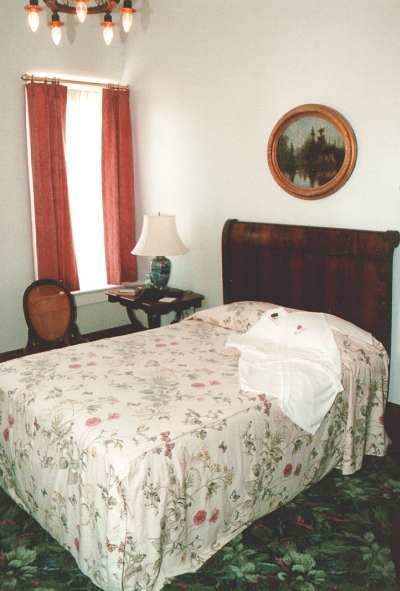 The heart-shaped Jacuzzi bathtubs get the blood circulating, and heart-warming antique furnishings, stained-glass windows, and bed and breakfast hospitality contribute to a romantic, intimate experience. Weddings, honeymoons, anniversaries, and weekend getaways are made even more special by the amorous magic of the hotel. Groups. The intimate size of the Bailey Hotel is ideal for small gatherings of people—families, friends, clubs, coworkers—to get away together in the same hotel. Small groups can stay and hold seminars in one location, while enjoying the luxurious, vintage hotel surroundings and the stress-free pace of the community. Consume the history and Americana that is Humboldt and enjoy the attractions of the area together. Humboldt Historical Museum, Neosho Valley Woodworks, Humboldt Speedway, the Johnson- Sweatt Classic baseball tournament, The Martin and Osa Johnson Safari Museum, Iola golf courses, Chanute golf courses, the Neosho River, Biblesta, the Buster Keaton Celebration, Humboldt Civil War Days, Civil War Memorial, Confederate Soldier Marker, Funston House, Allen County Historical Museum, Bowlus Fine Art Center, Allen County Veterans Memorial Wall, Iola Bandstand, Old Allen County Jail Museum, Riverside School, Russell Stover Candies Factory Outlet, Mem-Erie Museum, St. Ann's Academy Infirmary & Guest House, Highland Park, Thayer Museum, Neosho Wildlife Area, Nu-Wa Industries Factory Tour , Pawnee Wildlife Preserve, Allen County Community College, Neosho County Community College (attended by NBA player Janerro Pargo). Here is a short blurb on the founding of Humboldt. Don't see your favorite attraction? Please contact the webmaster to recommend an area attraction to include in the Bailey Hotel website. the Country Pubs and Small Hotels Ring. Chanute, Erie, Galesburg, St. Paul, Thayer, and Stark. Other area towns include Independence, Ft. Scott, and Parsons. Click here if you are looking for the Bailey Hotel in Bunkie, Louisiana.